The cash for clunkers program sponsored by the US federal government is now over but you can still benefit from the cash for phone systems clunkers idea I mentioned a few weeks back. As a reminder, using services like SIP trunking, VoIP and IP communications you can save tens of thousands if not millions of dollars (euros, yen, etc) on phone and conference calls. 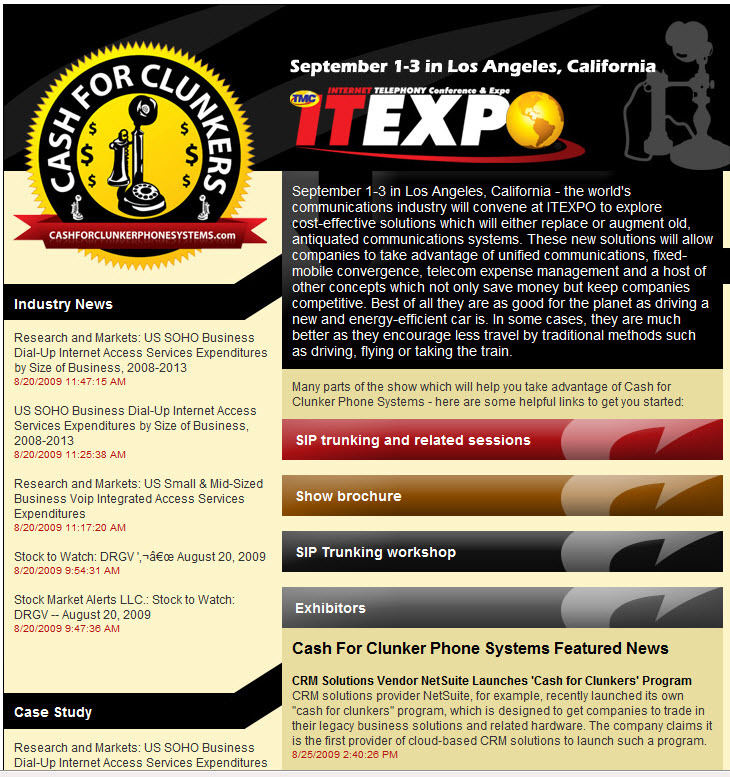 There is an official cash for phone system clunkers web page now with links to important references such as ITEXPO which is the global gathering place for all things IP communications. Utilizing the Global IP Solution's VideoEngine, Yahoo! Messenger will now support free video calling to all Yahoo! Messenger users. Over 133 users worldwide can now take advantage of Yahoo! Messenger 10 which includes high-quality video I witnessed a few weeks back. According to the video below the new Blackberry Storm 2 will perform head and shoulders above the original Storm and the iPhone. With a multitouch screen and Piezo electronics allowing a smoother and faster text inputting system we can expect the sleeker looking Storm 2 to pose a bigger challenge to Apple, Nokia, Microsoft, Google and others. Expect the device to run on the Verizon and AT&T networks and of course WiFi support has been added as well which should allow the smartphone to be a much more worthy adversary to virtually every other competitor on the market which already supports this wireless standard. My insticts tell me this phone should cause Apple some concern and make it more difficult for Nokia, Google and others to take smartphone share. I am looking forward to using it myself and sharing thoughts and analysis. Google today unveiled Listen, an application which allows users of the company's Android devices to search for content in podcasts based on keywords in the headline and description of the content. To me the incredible thing about this application is that it doesn't work with the iPhone, Windows Mobile or Nokia devices. No, this app is Android only at the moment. And while we may seem "Listen" on other platforms soon, for now Google has the potential to use the app to push sales of Android devices.